A rotisserie chicken is a lifesaver in the kitchen, particularly when you are low on time. In addition to its convenience, it generally doesn't cost more than buying a whole chicken and roasting it at home. However, purchasing a whole rotisserie chicken can be intimidating if you haven't handled one before and need to cut it up. Once you have done it, you will find it is easy to master. 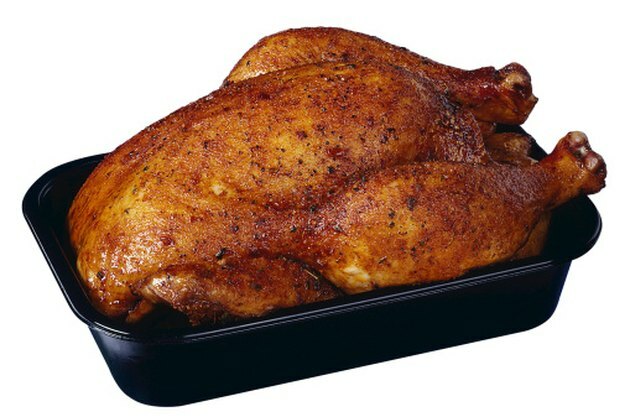 Remove the rotisserie chicken from the packaging and place onto a cutting board. The cutting board provides a flat surface that steadies the chicken and makes it easier to cut. Cut through the binding string used to tie the legs together if it is still on the chicken. Position the chicken horizontally and breast-side up on the same side as your dominant hand. For example, if you are right handed, place the chicken on your right side. Pull the leg and thigh away from the chicken and cut through the connective joint. Repeat this for the other leg. Place the leg and thigh combinations on the cutting board and cut the joint that connects them. Make a deep horizontal cut just above each wing. Carve thin slices of the chicken breast between the two major cuts. Start from the outer edges of the chicken breast and work inward. Remove the thin slices of chicken breast and transfer them to the serving platter. Pull the wing out from the chicken cavity and cut through the wing joint. Repeat this same process on the other side. Add the wings to the serving platter. Remove any solid pieces of chicken and discard the remaining chicken cavity. Serve the rotisserie chicken in its pure form, on sandwich rolls as a sandwich, on top of a salad or in a pasta.